← Quem (ou o quê) está prestando ajuda? 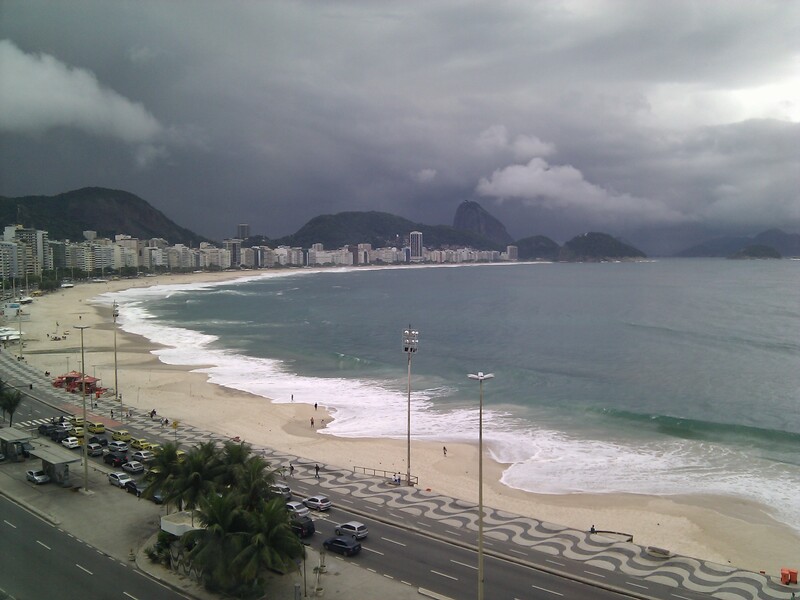 This past summer, the sand at Arpoador Beach began to disappear, long before the customary winter shrinkage. Snack and beverage vendors, licensed by the city to operate in a now nonexistent spot, demanded a new venue. It’s not known if they got one, but a globally-warmed Rio will certainly be dealing with such problems, and many more serious, in the not-too-distant future. Any carioca can tell you the future Besserman describes is here; both urban life and terrain are marked by the days when mudslides bring the city to a standstill. Rio’s petrochemicals and steel industries are located in lowland areas at risk, with about US$ 60 billion already invested in their projects. Gusmão said flooding will be a key issue for them. At this magical moment for Rio de Janeiro, we don’t hear much about the environment. You might say that Cinderella is obsessing over finding a purse to match her crystal pumps, when she and the prince ought to be calculating moat overflows. “We’re going to have the Dutch at our door, saying ‘you need something we know how to do’,” Besserman said. Every ongoing project should spend up to 30% more than budgeted, he added, to prepare. Not many people are thinking about the city’s energy vocation, either. As if the global economy will ever continue to be fed by fossil fuels, goverment officials and the media tend to focus on new oil discoveries and a debate begun last year over whether petroleum royalties should be kept in-state or not. But the picture has already flipped. Using our heads to get ahead? Rio’s potential is the focus of a must-read essay in the newly published Rio: a hora da virada, organized by economists André Urani and Fabio Giambiagi (the entire book is required reading for anyone who has a grasp of Portuguese and wants to get the word from experts on what is happening in Rio and what the challenges are, in every sphere of urban existence). “The dynamic center has shifted. The dynamism of the Brazilian economy, far beyond momentary phenomena, will depend on its capacity to face the broadest and most rapid technological transition in economic history, one which in the next couple of decades will bring the planet’s developed societies from a civilization of fossil fuels to a low-carbon economy,” write Sérgio Besserman, Rodrigo Rosa and Clarissa Lins in Sustentabilidade é competividade: para o Rio e para o Brasil (Sustainability is competitiveness: for Rio and Brazil). The authors argue that Rio de Janeiro is uniquely positioned as the world makes this transition. “… in the world and in Brazil there are cities more advanced than Rio de Janeiro in terms of sustainable policies and practices. But there is no city with 6.2 million inhabitants, about 12 million in its metropolitan region, with a vast constructed space and three large urban forests, two bays, a lagoon system and a long ocean coastline,” the essay notes. It’s not for nothing that Rio, they add, will host the 2012 U.N. Conference on Sustainable Development, followup to the 1992 environmental conference also held here. A Siemens-sponsored Economist Intelligence Unit study puts Rio among the top Latin American cities ranked by environmental sustainability. “There are very strong reasons for the sustainability agenda to be one of the axes, if not the principal axis, of the great transformations now taking place in Rio de Janeiro,” say Besserman, Rossa and Lins. Already, the city has set greenhouse gas emission reduction goals, begun to expand mass transportation, substituted the old Gramacho trash dump with a state-of-the art landfill in Seropédica, and started to clean up the Lagoa and Guanabara Bay. Much remains on the agenda; a new model for sustainable development and governance is a high priority, the essay notes. Sewage treatment covers only 30% of all households. Environmental education is needed to help change citizens’ habits. 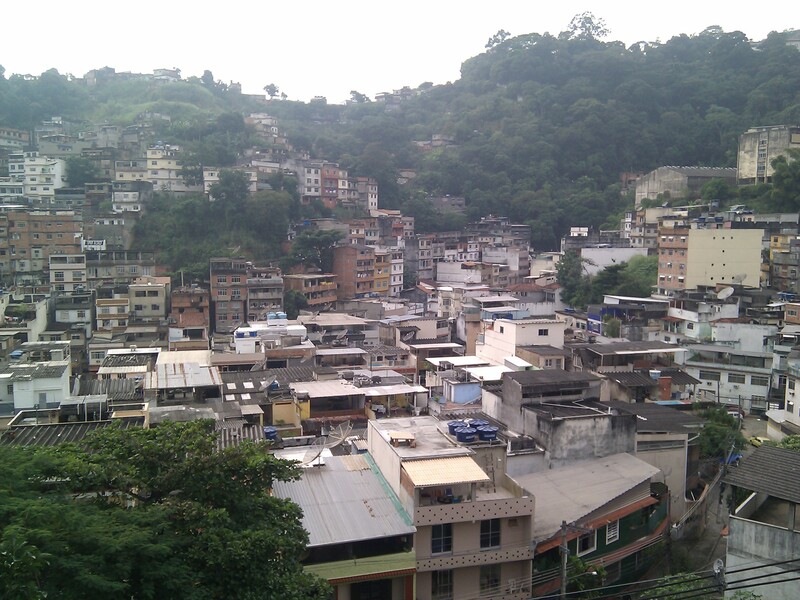 The Morar Carioca favela upgrade program could incorporate solar panels and rainwater utilization. Regulators need better tools for measuring environmental and social costs, business should be induced play a bigger environmental role in the city, and there should be more community participation in policymaking and implementation. Of particular concern to these writers and other environmental experts is the development occurring in and around Sepetiba Bay, in the city’s West Zone. The essay suggests a governance model based on the creation of a powerful non-partisan technical agency to help the city set goals and monitor performance of those who utilize its shores and waters. And at least one environmentalist, sociologist and political scientist Sérgio Abranches, who also spoke at the Rio de Encontros debate, urges a more radical rethink of Rio de Janeiro’s vocation. The current focus on steel and petroleum is backward, he says; the future is not in the rearview mirror to the smokestack 1950s, but forward to knowledge-based activity, such as biofuels, nanotechnology and neuroscience. Should cariocas stop using plastic bags and ride bicycles to help Rio become more sustainable? Yes, said Besserman. But we also need to get more involved, to “make politics with a capital P”. This entry was posted in Brazil, Transformation of Rio de Janeiro / Transformação do Rio de Janeiro and tagged A hora da virada, Clarissa Lins, green cities, Paulo Gusmão, Rio de Encontros, Rio de Janeiro environment, Rio de Janeiro global warming, Rio de Janeiro revitalization, Rio de Janeiro sustainable development, Rio de Janeiro transformation, Rodrigo Rosa, Sérgio Abranches, Sérgio Besserman. Bookmark the permalink. 2 Responses to Rio: the new Venice? During my stay in Rio I watched a small environmental calamity unfold (http://temporarycarioca.blogspot.com). It was not any one factor but the culmination of decades of neglect, and was triggered by two micro events, a temperature change and heavy rains. Awareness and education are the only tools to prevent this from happening again. Keep beating the drum to keep people awake. What is the alternative? Well put, Michael, thanks! I enjoyed your post about the Lagoa.